AirShield2ShadowIoTInfographic | 802 Secure, Inc. While IoT brings about new forms of communication, analytics, and automation; it’s also predominantly wirelessly enabled. 80% of IoT is wireless, using WiFi, Bluetooth, Zigbee, LTE, and more. Therefore, IoT networks can operate autonomously from the enterprise network, many times never connecting to it. While organizations are focused on IoT rogues on the wired network, the majority of IoT is wireless and off the network. 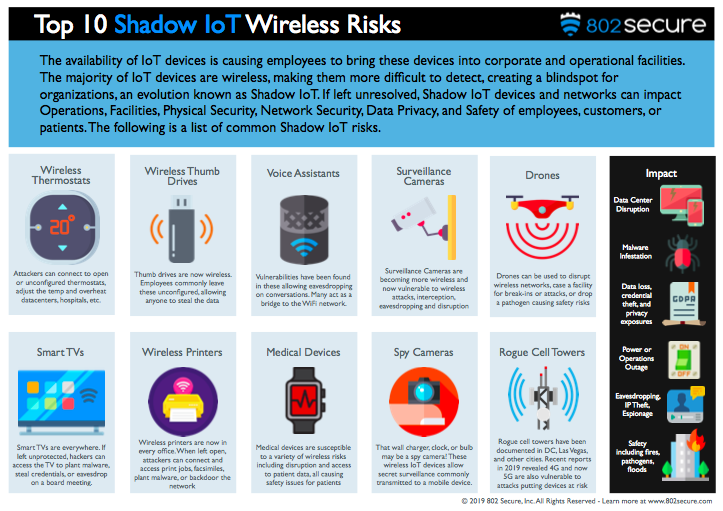 This combination of unknown and unmanaged IoT devices used by employees is known as Shadow IoT.